Human microsatellite-stable (MSS) colorectal cancers (CRCs) are immunologically “cold” tumour subtypes characterized by reduced immune cytotoxicity. The molecular linkages between immune-resistance and human MSS CRC is not clear. We used transcriptome profiling, in silico analysis, immunohistochemistry, western blot, RT-qPCR and immunofluorescence staining to characterize novel CRC immune biomarkers. The effects of selective antagonists were tested by in vitro assays of long term viability and analysis of kinase active forms using anti-phospho antibodies. We identified the lymphocyte antigen 6 complex, locus G6D (LY6G6D) as significantly overexpressed (around 15-fold) in CRC when compared with its relatively low expression in other human solid tumours. LY6G6D up-regulation was predominant in MSS CRCs characterized by an enrichment of immune suppressive regulatory T-cells and a limited repertoire of PD-1/PD-L1 immune checkpoint receptors. Coexpression of LY6G6D and CD15 increases the risk of metastatic relapse in response to therapy. Both JAK-STAT5 and RAS-MEK-ERK cascades act in concert as key regulators of LY6G6D and Fucosyltransferase 4 (FUT4), which direct CD15-mediated immune-resistance. Momelotinib, an inhibitor of JAK1/JAK2, consistently abrogated the STAT5/LY6G6D axis in vitro, sensitizing MSS cancer cells with an intact JAK-STAT signaling, to efficiently respond to trametinib, a MEK inhibitor used in clinical setting. Notably, colon cancer cells can evade JAK2/JAK1-targeted therapy by a reversible shift of the RAS-MEK-ERK pathway activity, which explains the treatment failure of JAK1/2 inhibitors in refractory CRC. Combined targeting of STAT5 and MAPK pathways has superior therapeutic effects on immune resistance. In addition, the new identified LY6G6D antigen is a promising molecular target for human MSS CRC. Colorectal cancer (CRC) development involves complex interactions between malignant cells and immune system, not comprehensively defined . Targeted therapies have improved patient outcomes. However, multiple drug resistance mechanisms often converge to reactivate the original pathway targeted by these drugs or alternatively compensatory kinase cascades . Mutations in Mitogen-activated protein kinase (MAPK) cascade, phosphoinositide 3-kinase CA (PIK3CA) or aberrant activation of tyrosine kinase receptors (HER3 or MET) function as prominent factors of resistance [3, 4]. In CRC patients, only a modest clinical effect of MAPK inhibitors has been reported. In this context, studies have shown that CD15, also called Lewisx antigen, synthetized by Fucosyltransferase 4 (FUT4), is induced by the RAF-MEK-ERK signaling pathway, and colon cancers that are FUT4+/CD15+ seem to exhibit significant alteration of the systemic immune surveillance and resistance to the anti-EGFR agents (cetuximab) . This mechanism blocks cytotoxic T lymphocyte activities against tumour cells, making malignant cells progressively more aggressive and difficult to treat [6, 7]. 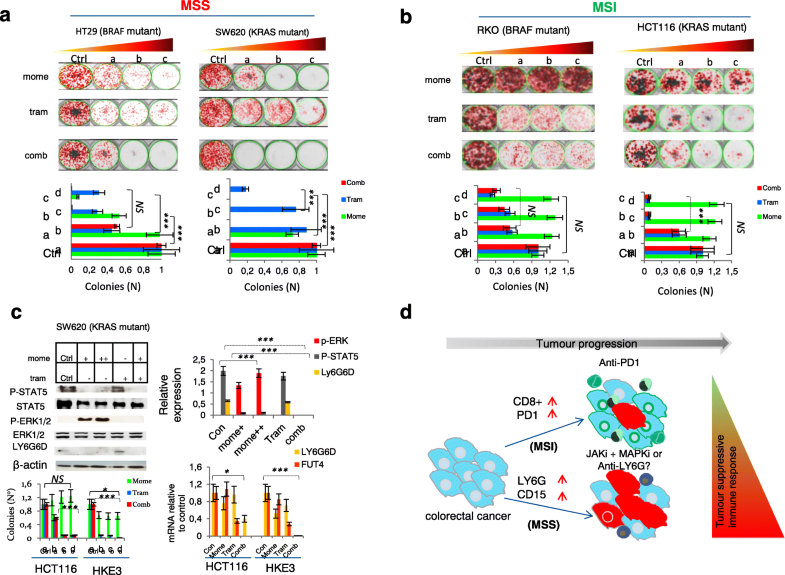 It is well known that microsatellite instability (MSI) and mismatch repair (MMR) defects can lead to DNA hypermutation and the production of immunogenic neo-peptides, recognized by antigen-specific tumour infiltrating lymphocytes, which is counterbalanced by the upregulation of multiple immune checkpoint molecules [8–10]. These tumours are characterized by a predominant type of T helper cells (Th) with Th1 phenotype (Th1), which potentiate the lytic function of cytotoxic effector T cells present in the tumor microenvironment, activating IFNγ, IL-15 and JAK (Janus kinase)/STAT (signal transducer and activator of transcription) pathways [11, 12]. Tumours defective in MMR machinery represent only 5% of all metastatic colorectal cancers and they are more easily recognized by the immune system . The Food and Drug Administration (FDA) has recently approved the checkpoint inhibitor anti-Programmed cell death protein 1 (PD1) for the treatment of metastatic MMR defective CRC, when the disease has progressed after chemotherapy . Unfortunately, mutations in (JAK1/JAK2) or class I MHC molecules (TAP2, B2M) and other still unknown signaling molecules can promote an inadequate immune response against tumours [14, 15]. In addition, the identity of tumour-intrinsic immune antigens that interfere with cancer immunogenicity and antitumour T cell responses in MMR proficient tumours are poorly understood. The lymphocyte antigen 6 complex, locus G6D (LY6G6D) belongs to a cluster of leukocyte antigens located in the major histocompatibility complex (MHC) class III region on chromosome 6 . LY6G is a small protein attached to the cell surface by a glycosylphosphatidylinositol (GPI) anchor, employed as a marker to identify granulocytes and myeloid-derived suppressor cell subpopulations in mouse . LY6G family members might be useful as cancer vaccines and drug conjugated antibodies, but their relevance in human diseases remains enigmatic [16–18]. 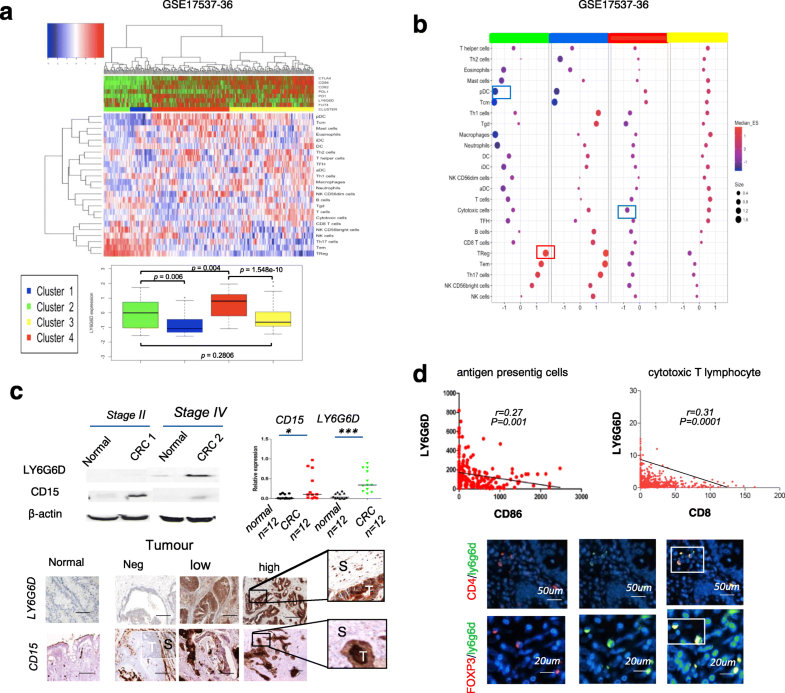 We here used in silico approaches, expression profiling and in vitro functional assays to characterize novel cancer-specific immune antigens in poorly immunogenic colon cancer subtypes. Our data identify LY6G6D antigen as a potential molecular target for human microsatellite stable tumours and provide evidences supporting that a combined targeting of MAPK and STAT5 signaling can improve the therapeutic response in this subtype. Materials and Methods and any associated references are described more in detail within the Additional file 1. 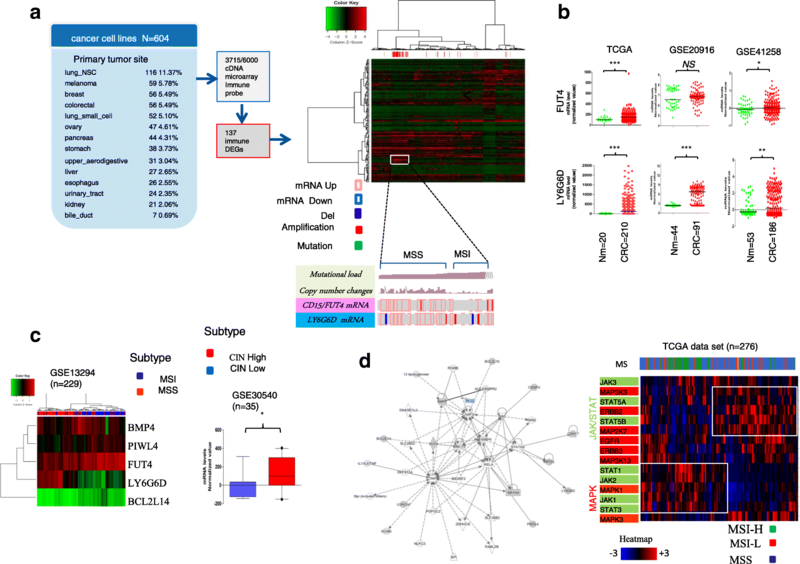 The Gene Expression Profile from 604 cancer cell lines representative of 14 different tumor sites from the Cancer Cell Lines Encyclopedia series were analyzed. We selected a collection of ~ 6000 known human genes with immunomodulatory functions from InnateDB, Innate Immunity Genes curated database (http://allergen.innatedb.com/). ANOVA analysis was adopted to test for differential expression among different tumor subtypes while eta squared was used to determine those with a greater effect size. A series of 55 colorectal cancer cell lines from the Cancer Cell Lines Encyclopedia was selected to visualize DNA copy number and mutational load. A total of 17 cancer types were retrieved from The Cancer Genome Atlas (TCGA) dataset to analyze gene expression levels. To analyze the expression changes related to specific immune cell subpopulations, we applied a deconvolution approach based on Gene Set Enrichment Analysis (GSEA). Unsupervised hierarchical clustering was then applied on the Euclidean distance and Ward linkage method on the matrix of the enrichment scores. Two independent datasets of patients with sporadic CRC were retrospectively recruited and collected (Additional file 2: Table S1 and Table S2). Additional samples included sections of fresh tissue specimens from tumor and matched normal adjacent mucosa frozen in liquid nitrogen. The recruitment of the patients was performed in accordance with the ethical guidelines, protocol number: 1703/2016 of September 2016 from the San Filippo Neri Hospital, Rome, Italy. The tissue microarrays (TMAs) used for this study included tumor tissue from 516 unselected colon carcinoma and 92 corresponding normal mucosa specimens. Construction of the TMAs has been previously described . TMA slides were stained individually with horseradish peroxidase-conjugated avidin biotin complex (ABC) as previously reported . Infiltrating immune cells were counted automatically by using ImageJ-based software. Whole tissue sections were used for double immunofluorescence analysis. Human colon cancer cell lines were purchased from American Type Culture Collection (ATCC, Rockville, MD, USA) or kindly donated from other laboratories and they were cultured as described . All cell lines were mycoplasma free. Each drug was diluted in culture medium, just before each experiment. The data from the Genomics of Drug Sensitivity in Cancer project (Sanger panel) were retrieved for more of 30 colon cancer cell lines. A set of 481 small-molecules that collectively modulate a broad array of cell processes (https://portals.broadinstitute.org/ctrp/) was used to identify colon cancer dependencies to inhibitor molecules. Cell proliferation/survival was measured using the 3-(4,5-dimethylthiazol-2-yl)-2,5- diphenyltetrazolium bromide (MTT). The IC50 was determined by interpolation from the dose response curves. Long term viability following drug treatments was assessed by colony formation assays. The analysis of Kinases in its active form was performed by using specific antiphospho antibodies that recognized the phosphorylated active forms normalizing with to antibodies against the total protein. For RNA interference, small inhibitor specific RNAs and scrambled control were transiently transfected into cells. Reverse Transcription Real-Time Quantitative PCR (RT-qPCR) was used to quantitatively determine mRNA expression normalized to GAPDH mRNA or rRNA 18S levels. The statistical analyses were carried out using Prism version 4.02 (GraphPad Software, Inc), GeneSpring R/bioconductor v.12.5 and R based package. We initially analyzed public transcriptome microarrays data derived from 604 human cancer cell lines  representative of 13 solid tumours to identify differentially expressed immune-related genes derived from Immport collection (http://www.immport.org/immport-open/public/home/home, (Fig. 1a). Gene expression profile using unsupervised hierarchical cluster analysis showed that eight genes clustered in a single branch were enriched in colon cancer as compared to other cancers (FDR < 0.01; eta squared > 0.3) (Fig. 1a and Additional file 3: Figure S1a). Notably, two genes of cluster i) a member of the lymphocyte antigen-6 (Ly6) complex, locus G6D (LY6G6D), localized on the MHC class III region (6p21) and ii) a member of the fucosyltransferase genes (FUT4), encoding for the fucosylated Lewisx antigen, here called CD15, as reported , were highly overexpressed in CRC, discriminating MSI and MSS subtypes (Fig. 1a, Additional file 3: Figure S1a). To test the robustness of these predictions, we analyzed primary CRC samples from three independent datasets, TCGA, GSE20916  and GSE41258  using as a control matched normal colonic tissues. In all data sets, LY6G6D was highly expressed in colorectal cancer compared to normal tissues, whereas FUT4 expression levels, tended to be significantly higher in CRC than in normal mucosa in two out of three databases (Fig. 1b). For the remaining genes of the cluster, their expression levels were lower or unchanged in CRC, compared to normal mucosa (Additional file 3: Figure S1b). As LY6G6D and FUT4 tended to be upregulated in MSS (typically poorly immunogenic), but not in MSI (typically highly immunogenic) CRC cell lines, we then analyzed other primary tumours by using GSE13294  and GSE30540  datasets, where MS status and chromosomal instability were available. Notably, we confirmed that LY6G6D expression levels were significantly higher in MSS than in MSI subset and tend to be significantly higher in chromosomal instability high (CIN-high) than in CIN-low tumours (Fig. 1c). In addition, analysis of additional datasets (n = 569) revealed that primary CRC surgical specimens can be discriminated in low or high-LY6G6D, but not on the basis of FUT4 expression levels (Additional file 3: Figure S1c). To unveil signaling pathways regulating LY6G6D and FUT4, we carried out a network analysis to look for potential interactions and regulators. We found that protein kinases, mainly MAPKs (ERKs and p38 MAPKs) and STAT5 regulated FUT4 and LY6G6D expression, respectively (Fig. 1d). To establish the relevance of these findings, we determined the expression of genes from MAPKs and JAK/STAT cascades in distinct CRC subtypes (TCGA, n = 276) stratified as MMR status. While components of MAPK cascades were broadly expressed, the majority of JAK/STAT genes presented higher expression in MSI than in MSS tumours according with literature . Notably, among JAK/STAT genes, only STAT5 showed higher expression in MSS than in MSI and clustered with MAPK genes (Fig. 1d). Indeed, a review of exome sequencing data (N = 2078 CRCs from cbioportal) showed a high prevalence of JAK1/2 mutations, but not of STAT5, in hypermutated tumours [10, 14] (Additional file 3: Figure S2a). As ERKs and JAK/STAT5 cascades have been implicated in immune evasion, we analyzed tumor-infiltrating immune cell subpopulations in relation to gene expression levels of LY6G6D, FUT4 and others key immune modulatory molecules. Immune cell deconvolution revealed that CRCs clustered based on enrichment of distinct immune cell types (Fig. 2a and b and Additional file 3: Figure S2b). In particular, we found that a CRC subtype characterized by high Tregs and low dendritic cells (DC) showed high expression levels of LY6G6D in concurrence with decreased expression levels of several immune checkpoint molecules such as CTLA-4 and PD1 [2, 3] (Fig. 2a and b Cluster 2, green). Similar observations were obtained using an independent dataset of validation. Also in this case, high levels of LY6G6D expression were correlated with high infiltrates of immune suppressive cell types, such as the regulatory T cells (Tregs) and T helper 2 (Th2) cells, which play a key role as mediators of antitumor immunity (Additional file 3: Figure S2c, Cluster 4, green). On the contrary, FUT4 tended to be upregulated in malignant cells (Fig. 2c) displaying no significant correlation with specific immune cells type, consistent with literature . These observations suggest that LY6G6D and FUT4 may be responsible for cancer progression acting as tumour-intrinsic immune suppressive factors. To further investigate the role of LY6G6D and FUT4, we focused on CD15, a cell-surface antigen encoded by FUT4, whose over-expression in metastatic CRC is associated with lack of response to EGFR and VEGF inhibitors . We studied by western blot analysis our in-house snap frozen CRCs (n = 12) and healthy mucosa samples (n = 12) obtained from the same patient. We observed increased expression of LY6G6D and CD15 in primary CRC as compared with healthy mucosa. Semi-quantitative protein analysis revealed that LY6G6D, but not CD15, was consistently higher in stages III and IV than in stages I and II of primary tumours (Fig. 2c). Next, we performed immunohistochemistry (IHC) in two independent datasets (I and II) comprising 517 surgically resected tumors and 77 normal mucosa samples (Additional file 2: Tables 1 and 2). IHC results revealed that approximately 70% of tumours expressed CD15 in malignant cells (Additional file 3: Figure S3a), which correlated with a reduction in the infiltrating neutrophils and monocytes (Fig. 2c), in line with previous findings . Notably, more than 80% of tumours exhibited LY6G6D staining, compared to 20% of normal tissues (Additional file 3: Figure S3a). Accordingly, double immunofluorescence on paraffin embedded tumours revealed that CD4+ and FOXP3+ T cells (Treg) were positive for LY6G6D staining, whereas CD8+ T lymphocytes did not (Fig. 2d and Additional file 3: Figure S3b). The number of infiltrating LY6G6D positive cells was significantly higher in CRC than in normal mucosa. In fact, tumours with increased number of infiltrating leucocytes exhibited stronger LY6G6D expression in malignant cells (Fig. 2c and 3a). We next explored the nature of immune tumor microenvironment in MSI and MSS tumours by immunohistochemistry. We found that intratumoral staining of LY6G6D in both malignant and infiltrating immune cells was higher in MSS than MSI tumors (Fig. 3b and c). In contrast, MSI subset exhibited stronger PD1 and PD-L1 staining as compared to MSS tumours (Fig. 3b and c). Accordingly, JAK1 staining revealed the presence of higher levels of JAK1 in MSI than in MSS. Moreover, tumours positive for JAK1, PD1 and PDL1 were associated to a favorable prognosis as compared to those negative ones (Additional file 3: Figure S4a-d). Notably, phospho-Stat5 (P-STAT5) and LY6G6D positive staining displayed a direct correlation, so that, tumours with high levels of P-STAT5 and LY6G6D (LY6G6Dhi) were associated with a shorter patients survival rate (Fig. 3a and Additional file 3: Figure S3d and Figure S4a-d). Consistent with these results, the screening of dataset II alone confirmed that LY6G6Dhi tumours correlated with shorter disease-free survival and a reduced response to therapy compared to LY6G6D-low/neg tumours (Fig. 3d and Additional file 3: Figure S4d). In this latter database, coexpression of LY6G6Dhi/CD15hi resulted in a poorer clinical outcome compared to each marker alone. We observed that the relapse-free survival at 5 years was only 33,6% for LY6G6Dhi/CD15hi patients compared to more than 95% for CD15neg/LY6G6Dneg subgroup. Intermediate results were obtained for the remaining group of patients (Fig. 3d). These results suggested that elevated levels of LY6G6D and CD15 may promote disease progression by inducing immune subversion of the tumor microenvironment. To understand how ERKs and JAK/STAT5 signaling regulates CD15/FUT4 and LY6G6D function, we first investigated the treatment response of human CRC cells (N = 38) to the MEK inhibitor, Trametinib, and the JAK1/2 inhibitor, ruxolitinib, by integrating genomic and transcriptomic data from the Cancer Cell Line Encyclopedia (CCLE) and Genomics of Drug Sensitivity from Cancer project, https://www.cancerrxgene.org/ (Fig. 4a and b). This screening revealed that in poorly immunogenic cells (MSS), characterized by the lack of JAK–STAT mutations, CD15/FUT4 and LY6G6D upregulation have a low sensitivity to the JAK inhibitor. In contrast, the treatment with trametinib was highly effective in this subset of tumours (Fig. 4a and b). To corroborate these findings, we employed in-house CRC cell lines (RKO, HCT116, HT29, SW620, SW480) to analyze CD15/FUT4 and LY6G6D expression. According with previous data, CD15 was predominantly localized in the plasma membrane, while LY6G6D formed aggregates-like structure into the cytosol that were more abundant in MSS than in MSI cells (Fig. 4c). Notably, we found that ERKs and STAT5 activation under basal conditions were inversely correlated. The highest levels of P-STAT5 were detected in metastatic cell lines (i.e. SW620), which were characterized by enhanced LY6G6D protein expression (Fig. 4c). To further characterize which JAK/STAT inhibitor potentially interfered with LY6G6D, we treated colon cancer cells with ruxolitinib or momelotinib (Mom) alone. Notably, CRC cell lines were significantly more sensitive to momelotinib than ruxolitinib (around 30-fold) (Fig. 4d and Additional file 3: Figure S5a). A screening from the cancer therapeutics response portal (https://portals.broadinstitute.org/ctrp/) to find molecule drugs that target the JAK/STAT cascade more selectively, confirmed that momemolitib was one of the most effective molecules to inhibit STAT5 signaling (Additional file 3: Figure S5b). In line with this, STAT5b copy number variations was directly correlated with the sensitivity to momemolitib in a panel of colon cancer cells (N = 34; pearson correlation 0.308, Additional file 3: Figure S5b). These results indicated that momelotinib could be a good candidate to inhibit STAT5/LY6G6D axis, supporting further investigation about its effects when used in combination with the MEK inhibitor. Indeed, we found that the treatment with momelotinib or trametinib and its combination (JAKi/MEKi) resulted in a dramatic suppression of the growth rate of CRC cells known to have a primary resistance to Mab cetuximab (anti-EGFR)  (Additional file 3: Figure S5c and d). Consistent with these results, we extended the pharmacological treatment to a largest panel of cells analyzing colony formation. Interestingly, the JAK1/2 inhibitor enhanced the growth inhibitory effect of the MEK-inhibitor, particularly in poorly immunogenic BRAF or KRAS mutant cancer cells (HT29 and SW620) (Fig. 5a). In contrast, more immunogenic cancer cells with endogenous JAK2 deletion and BRAF or KRAS mutation (RKO and HCT116) displayed tolerance to momelotinib, reducing the combinatory effect (Fig. 5b). Taken together, these results indicate that tumours bearing LY6G6D and CD15 might be targeted by this treatment strategy, particularly those from MSS CRC subgroup. To understand whether the treatment with momelotinib affected the STAT5-mediated LY6G6D upregulation, we used as a metastatic model, the SW620 cell line, which is characterized by endogenous STAT5 activation and increased LY6G6D expression. We observed that momelotinib vigorously inhibited both STAT5 activation and endogenous LY6G6D expression (Fig. 5c). According with this datum, transient STAT5 silencing markedly reduced LY6G6D levels, indicating that both pharmacologic and genetic blockade of STAT5 signaling results in LY6G6D downregulation (Additional file 3: Figure S6a). 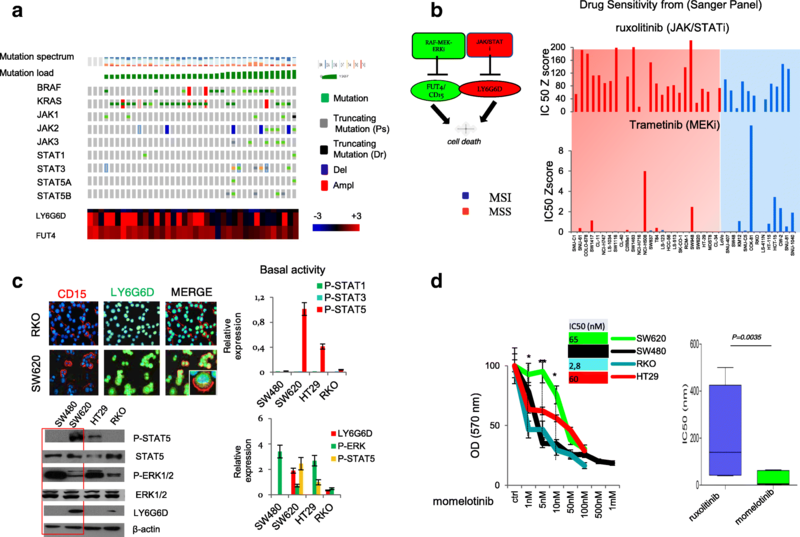 Notably, momelotinib induced a robust dose-dependent activation of ERKs signaling in a heterogeneous panel of cancer cells regardless of (HER3) activation (Fig. 5c and Additional file 3: Figure S6a,b). A similar effect on ERKs activation was observed upon exposure to ruxolitinib, supporting the hypothesis that colon cancer cells became sensitized to JAK inhibitors when they are treated with inhibitors of MEK-ERK pathway  (Additional file 3: Figure S6b). The treatment with trametinib did not alter LY6G6D expression, while confirmed FUT4/CD15 as a key mediator of RAF-MEK-ERK pathway  (Fig. 5c and Additional file 3: Figure S6c). Analysis of different MEKi using the public database, GDS5029 , supported that STAT5/LY6G6D signaling is a downstream mediator of resistance to MEKi in KRAS mutant CRCs (Additional file 1: Figure S6d). In addition, blocking the RAF-MEK-ERK cascade by trametinib, we found an increased phosphorylation of STAT3, another member of the Stat family (Additional file 3: Figure S6c). Given that KRAS or JAK1/2 mutations interfere with the IFN/STAT signaling pathway [26, 27], it was tested the sensitivity to the MEK/JAKi treatment in HCT116 cell line (bearing mutant K-Ras) and its derivative HKE-3 with wild type KRAS (wtK-Ras). We observed that the cell line expressing wtK-Ras displayed a lower viability in response to the drug combination than the cell line expressing mutant K-Ras (Fig. 5c). Remarkably, the combined treatment significantly abrogated LY6G6D and CD15/FUT4 expression in the cell line expressing wtK-Ras, but not in that with mutant KRAS (HCT116) (Additional file 3: Figure S6d). Therefore, these results indicate that upregulation of LY6G6D and CD15/FUT4 can be efficiently abolished using a combination of JAK/STAT and MEK inhibitors in poorly immunogenic CRC subset. It has been hypothesized that genetic alterations affecting signaling pathways can produce malignant variants resistant to immune effectors. We here provide evidence that LY6G6D is an antigen activated through JAK/STAT5 pathway in poorly immunogenic CRCs. Our hypothesis is also consistent with previous studies where systemic Ly6G+ cell depletion suppresses colitis-associated tumorigenesis and ApcMin/+ adenoma formation through CXCR2-dependent tumor-associated leukocytes . Therefore, LY6G6D might also act as a critical mediator of malignant growth and immune evasion in human CRC. We have confirmed LY6G6G expression in both cancer cells and Regulatory T cells (Treg), which are a highly immune-suppressive subset of T cells that prevents the development of effective antitumor immunity . Genomic data from the TCGA database are in agreement with our observations that both Tregs and myeloid-derived suppressor cells (MDSCs), are enriched in non-hypermutated tumors but not in MSI CRCs [9, 12, 13]. Consistent with this, LY6G6D expression is also enhanced in rare immune diseases, such as the autosomic dominant monocytopenia, characterized by systemic immune suppression. Notably, STAT5 activation is also required for the expansion of Treg or induction of specific immune checkpoint molecules [30, 31]. Ly6 genes may inhibit the formation of membrane attack complexes in tumor cells hampering cytolytic activity of T cells. However, the identity of their interacting partners remains a mystery . Our observations reveal that MMR proficient cancers characterized by less CD8+ T lymphocytes and low expression of PD-1/PD-L1 exhibit enhanced LY6G6D expression and STAT5 activation, implicating Ly6 genes as novel candidates for the development of new targeted therapies [17, 18] (Fig. 5d). The functional activity of JAK/Stat5 pathway can be regulated by the ERKs signaling, which controls the transcriptional upregulation of FUT4, resulting in an increased cell-surface expression of CD15 and resistance to the anti-EGFR agents [5, 32]. In line with this, coexpression of LY6G6D and CD15 increases the risk of disease progression in response to therapy, suggesting that both MAPK and Stat5 pathways likely foster colon cancer progression in concert. 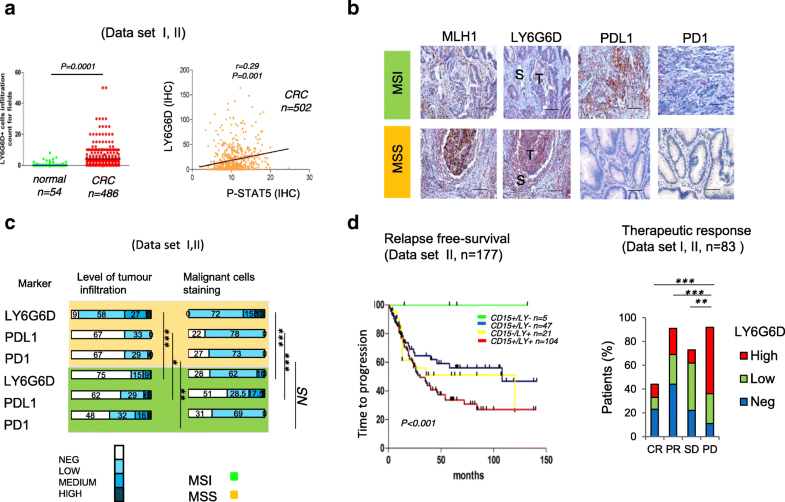 Although dysregulated JAK–STAT signaling represents an attractive therapeutic target for modulating the immune responses , JAKs inhibitors have shown limited clinical utility in solid tumours, including patients with refractory colorectal adenocarcinoma [34, 35]. A potential mechanism would be that mutations in JAK1/JAK2 might block PD-L1 induction, protecting cancer cells from immune attack . Not unexpectedly, we found that CRC cell lines mutant for JAK2 were less sensitive to the JAK/STAT inhibitor, momelotinib. Conversely, LY6G6D positive MSS cells (SW620) suppress T cell proliferation through the expansion of myeloid-derived suppressor cells, which were more vulnerable to momelotinib . In this context, a recent study suggests that momelotinib reduces the number of cancer stem cells associated to tumor burden in a mouse model of human ovarian cancer . However, in CRC cancer cell lines aberrant activation of MAPK signaling (RAS mutation or ERKs activation) was consistently involved in the mechanism of resistance to momelotinib. Ruxolitinib, the first JAK/STAT inhibitor approved by the FDA, enhances the expression of angiogenic factors by inducing NK cell–mediated tumor progression, suggesting that combined targeting of JAK/STAT and VEGF signaling can improve therapeutic response . This idea is supported by our observation that combined analyses of CD15 and LY6G6D should be evaluated as predictive biomarkers for the response to JAK- and MAPK-directed therapies. The anti-Ly6G antibody has been routinely used to deplete Ly6G+ cells in mice models, and it is well-tolerated and effective in a long term treatment. Its use might be an additional promising strategy to confer susceptibility to therapies in non-immunogenic and refractory human CRC. However, the treatment effects in human patients with colorectal cancer may significantly differ. Therefore, further investigation will be required to fully elucidate the mechanism by which LY6G6D promotes cancer progression. We here provide evidence that LY6G6D and CD15 promote chemo-immune-resistance in immunologically compromised colon cancers and can be used as biomarkers to decide patients treatment. Further preclinical studies would reveal if LY6G6D and CD15 antagonists, in addition to established chemotherapeutic protocols, can improve therapy response in refractory colorectal cancer. Guido Giordano and Pietro Parcesepe contributed equally to this work. We thank ARC-NET Research Centre core imaging facility for assistance with microscopy. We also thank Celia Sequera for her help in the initial cell signaling studies and S. Pagnotta for critical discussion and for the comments on bioinformatics and molecular aspects of the manuscript. This work was supported by Italian Ministry of University and Research (MiUR) “FFABR” (n.4982) to M.P. and by Grants SAF2013–48210-C2–02 and SAF2016–76588-C2–1-R to A.P. from the Spanish Ministry of Science, Innovation and Universities. G.G, P.P, M.R.D, L.C, T.D.R and A.R developed sample preparation, collected and processed data; P.P, C.F, and M.P carried out immunostaining experiments and in vitro assays; L.C, F.P.C and MP developed bioinformatics analysis; A.S, M.M, C.A.A, F.C and A.P provided samples, and assist in biochemical and functional studies. G.G, P.P and M.P conceived the study. A.P and M.P coordinated the in vitro experiments. M.P supervised the study with the help of G.G. M.P drafted the manuscript which was edited by G.G, L.C. and A.P. with input from all authors. All authors read and approved the final manuscript. This study was approved by the San Filippo Neri Hospital, Rome, Italy and has been performed in accordance with the ethical guidelines as reported in the 1964 Helsinki Declaration and its later amendments.